Cinematic cartography provides us with a sumptuous feast of data representation. It captures the intricacies and patterns of large datasets and, in particular, those that have some element of flow or movement about them. Here, NATS give us a state-of-the-art 2 minute 30 second video showing the patterns of air traffic in and out of UK airspace over a 24hr period incorporating some 7,000 separate flight movements. Of course, there are the usual flights in and out of the UK in addition to local flights but there’s also some really fascinating vignettes and what NATS do well is not simply present the viewer with a mass of moving stuff…they have gone to the effort of incorporating text and moving the image around to explain precisely what is being seen. This teasing out of individual elements gives context to the overall patterns and allows us to appreciate the complexity all the more. There’s an ebb and flow of movement beginning with transatlantic traffic, then European arrivals followed by the first wave of departures and the congestion build up around the usual nodes of London, Manchester and central Scotland. They then focus on the holding stacks over Heathrow airport before picking out some military training flights and the movement of oil-rig workers from Aberdeen to North Sea rigs. The aesthetic of the film perfectly matches the function with darker base elements and glowing flow lines. The marginalia and textual components are in balance with the overall piece and the movement, panning and zooming works well to take us on a tour without awkward jolts visually or in relation to the content in view. Speed, resolution and camera control are perfectly attuned to give the viewer a pleasing visual experience. Fascinating and beautiful. The melding of cartography with large fluid datasets in an engaging form. You can read more about the video and also links to other similar works from NATS on their web site here. Animation can be an extremely effective visual tool because it helps us visualize temporal patterns in a way that time slices cannot. Normally, though, we’re mapping something tangible; something that we can plot at different points in time and whose trace is only really seen once we’ve stitched the different slices together. Here, though, a different approach to cinematic cartography gives us a powerful message. Carbon Visuals wanted a way of visually expressing the amount of New York’s carbon emissions over an hour, a week, a month and a year. These blocks of time are easy to imagine when we look at the map…but what is it we’re to look at? The data could easily have been presented as a histogram or some other graphical method but they went much further. A 3D cityscape is used and we move through street level, eventually pulling up and over the top of the city to see it at a much smaller scale. The Carbon emissions are illustrated through inflated balls and as we move through time, more and more balls are added. The cityscape is rendered in light grey…the balls in blue and the contrast helps us easily pick out the two dimensions of the map. Space is simply a placeholder but it gives us scale and as we slowly pull back from the street to the wide view and the balls increase exponentially we see the mass of blue overwhelming the city. Comparisons are always useful in cartography and Carbon Visuals use it to great effect here. Clean and simple but emotionally charged and undeniably impactful. More details of this map on the Carbon Visuals web site here. Beautifully crafted cinematic quality visualisations tend to be used to map data that flows. Typically, we see movement of cars, planes, ships, migratory patterns of animals and the development of spatial datasets (e.g. OpenStreetmap) using these techniques. The medium is well suited to flow data and allows us to do what static cartography cannot – actually show the way in which goods, commodities, ideas and a wide range of phenomena traverse space. Here though, 422 South have taken the same approach and applied it to events that occur at a single point is space but at different times. At first sight a map that shows the location of lottery wins alongside the location of lightning strikes seems obscure. Of course, one bears no relationship with the other and there is very little reason for them to be mapped together. The point, though, is to contrast good luck (lottery wins) against bad luck (lightning strikes). A typical approach for this sort of data would be to just map all the locations at once but instead, the animated approach allows the temporal aspect to be represented. Lottery wins are displayed as proportional symbols with the circle size relative to the size of the win. The symbols are outlines with a hollow fill so they overlap neatly without obscuring information as events are added to the map cumulatively. Lightning strikes do not persist on the map – they appear as flashes. The life-changing persistence of one event and the fleeting impact of another is well matched by the mapped representation that reflects the character of the events. 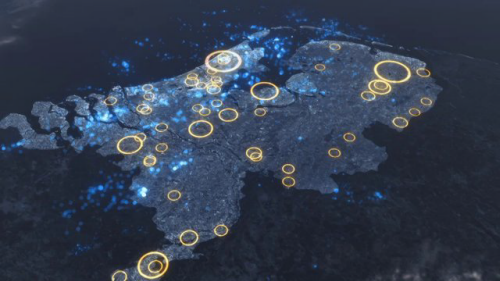 The satellite image of The Netherlands sits well across the muted basemap and transparency and camera position are used well during the animation. Animation works well and shows us the regular pulse of lottery wins juxtaposed with the rather more random incidence and prevalence of lightning strikes. Overall, a novel way of animating data that does not in itself move but one wonders if at any point lightning struck twice and resulted in a nearby lottery win! Tens of thousands of swirling ocean currents were captured and presented by NASA’s Goddard Space Flight Center in this animated map that creates a cinematic cartographic experience. These are surface currents that cover the period June 2005 to December 2007; the result of physical observation and modelling. The simplicity of the final map belies the complexity and computing power required to generate the results but rather than creating a detailed and complex graphic to expose how much effort and work went into the map, the work is left to shine and to amaze the viewer. NASA themselves describe the results as creating a ‘visceral experience’. Indeed, if cartography is about connecting and generating an emotional response then they succeeded. One of the rare animated maps that uses a soundtrack to good effect. Numerous versions of the animation can be found on NASA’s web site here.